This dog has a black coat trimmed with symetrical markings of white and rust. The Bernese Mountain Dog's thick coat does not fare well in hot or humid climates. The Bernese Mountain Dog has a jet black coat with white and rust colored trimmings around the eyes and paws. 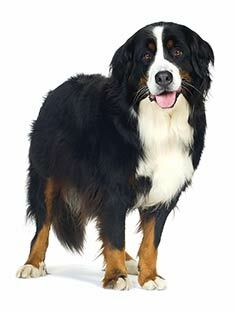 The Bernese Mountain Dog is a seasonal, heavy shedder and requires daily brushing. The Bernese Mountain Dog is very social and extremely loyal to its family. It usually attaches itself to one member in particular. The Bernese mountain dog is eager to please and easy to train. He is intelligent and loving and makes an excellent family dog. These dogs may be slow to mature and remain puppy-like for a while. 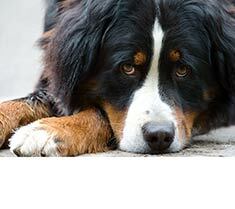 The Bernese Mountain Dog is susceptible to hip dysplasia, gastric torsions, hereditary eye diseases. It is also prone to cancer, bloat and eyelid problems. The Bernese Mountain Dog can be expected to live about 6-8 years. The Bernese Mountain Dog is not fit for apartments, it requires a large spacious yard in a cooler climate. Find Bernese Mountain Dog Puppies with our Free Breeder search!